OVER ITS NEARLY 40-YEAR HISTORY, G&B ELECTRONIC DESIGNS LTD HAS SHOWN RESILIENCE, ADAPTABILITY AND DETERMINATION TO SURVIVE AND SUCCEED THAT ARE AN EXAMPLE TO ANY SME THAT WISHES TO FLOURISH IN TOUGH TIMES. G&B ELECTRONIC DESIGNS LTD, FOUNDED BY GEORGE MCBROWN IN 1980, INITIALLY FOCUSED VERY MUCH ON THE SAME AREAS IN WHICH HE HAD BEEN WORKING AT SMITH’S INDUSTRIES, BEFORE HE WAS MADE REDUNDANT: ENGINEERING AND THEN CAD, PARTICULARLY ON PCB LAYOUTS. 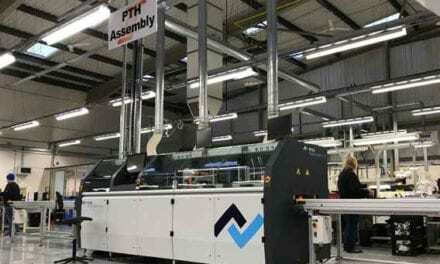 It expanded into making prototypes and short runs and grew sufficiently to move out of its first workshop, above a cycle shop in Haslemere, to a small factory in Liphook and ultimately to a 24,000 sq ft facility, designing and manufacturing high-speed surface-mount technology (SMT) electronics components, with no less than 12 designers on board. Then came the credit crunch. 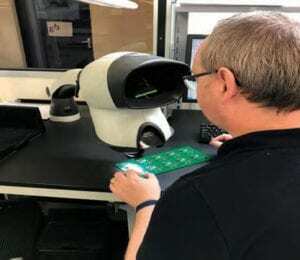 Mark Wilson undertakes an inspection process for printed circuit board assemblies under magnification. “2008 was a fork in the road for us,” said Laura McBrown, one of George’s two daughters, who stepped up to running the business in 2015. “CAD software licences cost £30,000 and we simply could not afford surplus capacity.” A lot of projects were axed; G&B Electronics itself had to cut its headcount and it was not the only one. A plethora of redundant skilled people established a lot of one-person businesses, with lower overheads and pricing so competitive that G&B had to rethink its business model. “We decided to axe PCB design and layout completely, and refocus on our contract manufacturing function,” Ms McBrown said. For a business that had been founded and had grown in the areas it was now closing down, it was quite a tough choice to make but it quickly proved to have been correct. The company discovered two particular areas of demand in the UK for specialised manufacturing in its area of expertise. The first was in the Defence sector. After 35 years at the helm of the company he founded and having seen it through some very demanding times, George McBrown decided to call it a day in 2015. Laura and her sister, Kate Sharp, had little hesitation in taking up the reins. 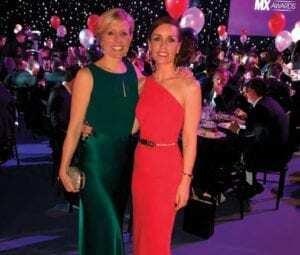 Instituting Excellence: Laura McBrown (MD) and sister Kate Sharp (HR director) at the Manufacturing Excellence awards dinner, where Laura was recognised as one of the country’s Top 100 in manufacturing. What remained constant through all the upheaval was the core of the business: its team and processes. But even the good has to become better. G&B Electronics today is a company that engages its workforce and shares responsibility, in keeping with contemporary, devolved, lean management style. G&B Electronics today is a company that engages its workforce and shares responsibility to a greater extent, in keeping with contemporary, devolved, lean management style. “We are more customer focused, in our processes and even in our marketing. We have developed customer service teams, rather than relying on individual relationships; apart from anything else, people on our side of the equation could get snowed under, if they had to handle an entire account on their own. Teams are stronger, more durable and more efficient.” It also means that project managers can focus and get on with their key responsibilities. The company has appointed a productivity specialist, who are tasked with looking at support and admin tasks and spreading the ideas of Lean manufacturing beyond the shopfloor. The adoption of electronic Bill of Materials importing, for example, has saved time, reducing G&B’s NPI (new product introduction) costs and product time to market for its customers, and almost completely eliminated human error in that area. 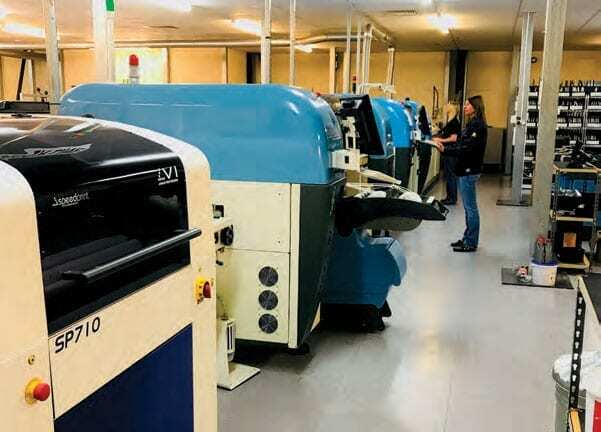 “Our product range is still centred on PCBs, populated and enclosed in plastic and/or metal housings, packaged and ready to go to the customer,” Ms McBrown said. This might involve holding components for final configuration and despatch to the ultimate customer and acting on behalf of the client in meeting specifications, issuing invoices and shipping to the end user. It saves the customer the cost of warehousing stock and cuts out at least one process stage. Approximately a third of the company’s customer base is now the medical devices sector; a similar proportion is aerospace and defence; the remainder is high-end audio and ‘others’. The quest for improvement is continuous. “We work with our supply chain and liaise closely with our customers on what their needs are likely to be, which will govern what we need in terms of stockholding,” she said. 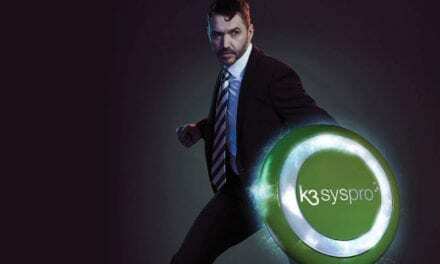 The need for high levels of accuracy in tracking, tracing and documentation is why it turned to K3 Syspro. “We require stringent control of supplies and of suppliers,” Laura continued. “The K3 Syspro system we have enables us to trace our supply routes, what we have received and what parts we have used, with ultimate accuracy.” The company began using K3 Syspro in 2012 and is now considering how it can utilise it better. 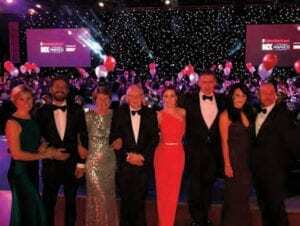 The McBrowns at the Manufacturing Excellence Awards. (L to R) Kate Sharp, HR Director; Rob Sharp (Kate’s husband); Catherine McBrown (Kate & Laura’s mother), George McBrown (company founder; Kate & Laura’s father); Laura McBrown, Managing Director; David Crowcombe (Laura’s husband) Natasha McBrown (Peter’s wife) and Peter McBrown (Kate & Laura’s brother). THE DETERMINATION AND ADAPTABILITY OF G&B ELECTRONIC DESIGNS LTD’S MANAGEMENT HAS BEEN RECOGNISED WITH A NUMBER OF AWARDS, FROM VARIOUS BODIES. “Made in the South East” award for SME Manufacturing Company of the year – 2015. Richard White, Head of Operations, was named in The Manufacturer Top 100 2018.